When selling your Zionsville, IN home, you cannot underestimate the power of curb appeal. As cool weather approaches, front yard curb appeal becomes critical and could mean the difference between selling your Zionsville, IN home before the holidays or waiting until next year. Adding to your curb appeal doesn’t have to mean big bucks, here is a variety of budget-friendly ways to improve your home’s curb appeal without busting the bank. Mulch. As the colder weather comes in, flowers and plants begin to die and the beds can become a bit of an eyesore. Laying down a new layer of mulch will not only look good but also protect the beds from the harsh winter weather on the way. Trim or shutters. Beyond landscaping you could also boost your curb appeal by adding extra trim and molding around windows and doors. From simple to ornate there are many styles to choose from. Depending on the style of your Zionsville, IN home adding shutters may punch up your curb appeal. Or, if you already have shutters, giving them a new coat of paint is sure to help. Front entryway. A new coat of paint on the front door and some updated house numbers can really help with updating the entryway to your home. 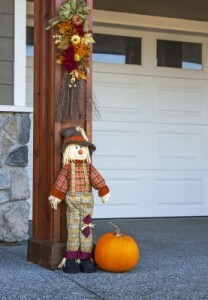 Adding a bit of seasonal décor will also lend a homey feel to your home to prospective Zionsville, IN homebuyers. It doesn’t take a large amount of money to update your home’s curb appeal. Use these tips and elevate your curb appeal just in time to sell your Zionsville, IN home before the holidays arrive. Contact a Zionsville, IN real estate agent today to start the selling process!